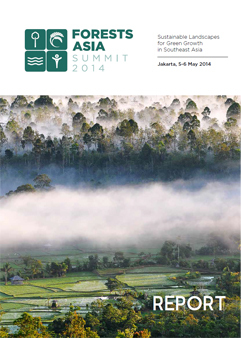 The Forests Asia Summit Report brings together the outcomes, achievements and key messages from the Forests Asia Summit, convened in Jakarta on 5-6 May 2014 by the Center for International Forestry Research (CIFOR) and the Ministry of Forestry, Indonesia. The report reflects on what the Forests Asia Summit sought to achieve and shares many of the highlights from the two day event. This includes key messages from Summit speakers and session hosts, as well as activities held on the sidelines of the Summit including high level bilateral and multilateral meetings and capacity building sessions. The report also looks at the significant communications and outreach campaign that supported the Summit and feedback provided by participants and partners following the conference.